I’m nearly finished writing my first novel, ‘Buried Ladies’, (please give me feedback on the first few chapters available free on Google Docs) so my thoughts turn toward publishing it. Maybe you’re in the same boat, so I thought I’d share my findings in researching how to publish a book. Also, check out my recent post reviewing books by Stephen King and Guy Kawasaki on writing. First, there are 2 general options: self publish or traditional publication models – click on the images below to enlarge them. 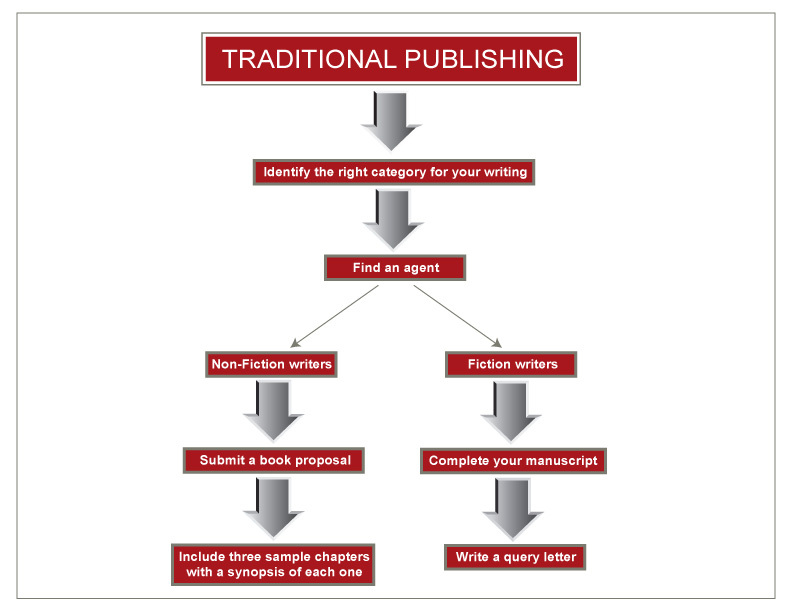 When most authors consider how to publish their work, they think of traditional publishing. In this model, you submit the book (or chapters and a proposal, if it’s non-fiction) to a publisher. But, first you’ll need an agent as most publishers won’t read unsolicited material unless it comes through an agent. Literary agents get 10%-15% of book sales for brokering the deal between you and the publisher. But, finding a good literary agent is REALLY hard. That’s because, unless you’re an established writer, there’s a lot of risk involved in representing your book, which involves time and money, both in short supply. So, agents only accept a small number of new writers and some aren’t taking on any new writers. Beware. There are a bunch of scam artists out there trying to take money from aspiring authors. Some want reading fees, others operating expenses. NO legitimate agent asks for fees upfront. So, run away quickly. Going the route of traditional publishing requires many of the same steps involved in self-publishing, so if you think the agent or publisher will take care of everything for you, you’re dead wrong — not literally, of course. The only step you won’t have to worry about is uploading it prior to publication. Everything else involved to self publish, you’ll still be doing. You just won’t have to pay for it upfront. Also, you’ll only have to approve cover designs, not create them. I don’t see the options as either/ or (but then I rarely do). So, here’s how I’m doing it. Since my book isn’t finished, I haven’t made a decision as to whether to seek out an agent and go the traditional route or self publish. I’m deferring that for now. Everything else I’m doing makes my book a stronger option in either case. I’m concentrating on writing the best novel I can. I really like it and I’m very critical of my own work, so that’s saying a lot. Please provide feedback and suggestions. Every week I sent out a few chapters for review – subscribe and I’ll send them to you — free. I ask readers to provide feedback and suggestions. Using Facebook and Twitter, I’m building a community of engaged readers. Please click on the link to join my community on either or both platforms. I share my chapters with this community and would love more feedback. I’m using a small Facebook campaign to help promote the book. Kickstarter is helping me pay for the upfront costs, like advertising, editing, and a small salary since I’m spending most of my time on this endeavor. Please consider donating — starting a $1. for enjoyment, as this this website conations really good funny information too.